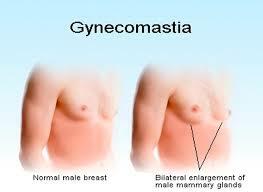 Gynecomastia is defined as swelling of the breast in boys and men due to a benign increase in breast tissue . The condition can affect one or both breasts, sometimes unevenly . Gynecomastia is triggered by a decrease in the level of testosterone compared to the body’s level of estrogen. Its frequency peaks for adult men between the ages of 50 and 80. It is estimated that at least one in four men in this age group are affected by the condition . Beyond normal hormonal changes due to aging in this group, increased body fat, anti-androgens used to treat prostate cancer and prostate enlargement, HIV/AIDS and anti-anxiety medications, tri-cyclic antidepressants, antibiotics and other medications can cause gynecomastia. In addition, health problems such as hypogonadism, hyperthyroidism, liver disease kidney disease and failure, and tumors of the testicles, adrenal glands or pituitary gland can lead to the condition . Copyright © 2018 Besins Healthcare. All Rights Reserved.